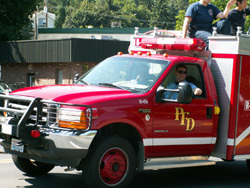 WFCD12 has a contract with the city of Pullman to provide transportation service for those patients requiring EMS care. In addition, most of the members of the department are either Paramedics, EMT-I, EMTB, or First Reponders. These members attend monthly ongoing training in accordance with state and federal standards for individuals with health care provider licenses. There has been the occasion where people have fallen into a cravas or down one of the steep canyons in our district. When this happens, normal patient extrication and transport becomes nearly impossible. This is when we rely on the Technical Rescue Team from the city of Pullman to get the patient quickly and safely from wherever they have fallen. When patients needing immediate transport are in remote areas of the district, sometimes it is necessary for us to leverage the services of medical air transport units. In our district, we use MedStar helicopter transport services to airlift patients in dire need of medical attention.